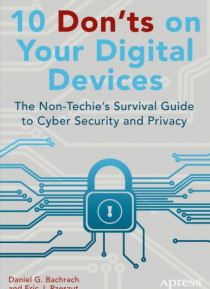 In nontechnical language and engaging style, 10 Don’ts on Your Digital Devices explains to non-techie users of PCs and handheld devices exactly what to do and what not to do to protect their digital data from security and privacy threats at home, at work, and on the road. These include chronic threats such as malware and phishing attacks and emerging threats that exploit cloudbased storage a… nd mobile apps.It’s a wonderful thing to be able to use any of your cloud-synced assortment of desktop, portable, mobile, and wearable computing devices to work from home, shop at work, pay in a store, do your banking from a coffee shop, submit your tax returns from the airport, or post your selfies from the Oscars. But with this new world of connectivity and convenience comes a host of new perils for the lazy, the greedy, the unwary, and the ignorant. The 10 Don’ts can’t do much for the lazy and the greedy, but they can save the unwary and the ignorant a world of trouble.10 Don’ts employs personal anecdotes and major news stories to illustrate what can—and all too often does—happen when users are careless with their devices and data. Each chapter describes a common type of blunder (one of the 10 Don’ts), reveals how it opens a particular port of entry to predatory incursions and privacy invasions, and details all the unpleasant consequences that may come from doing a Don’t. The chapter then shows you how to diagnose and fix the resulting problems, how to undo or mitigate their costs, and how to protect against repetitions with specific software defenses and behavioral changes.Through ten vignettes told in accessible language and illustrated with helpful screenshots, 10 Don’ts teaches non-technical readers ten key lessons for protecting your digital security and privacy with the same care you reflexively give to your physical security and privacy, so that you don’t get phished, give up your password, get lost in the cloud, look for a free lunch, do secure things from insecure places, let the snoops in, be careless when going mobile, use dinosaurs, or forget the physical—in short, so that you don’t trust anyone over…anything.Non-techie readers are not unsophisticated readers. They spend much of their waking lives on their devices and are bombarded with and alarmed by news stories of unimaginably huge data breaches, unimaginably sophisticated "e;advanced persistent threat"e; activities by criminal organizations and hostile nation-states, and unimaginably intrusive clandestine mass electronic surveillance and data mining sweeps by corporations, data brokers, and the various intelligence and law enforcement arms of our own governments. The authors lift the veil on these shadowy realms, show how the little guy is affected, and what individuals can do to shield themselves from big predators and snoops.